At Supreme Oven Cleaning Leicester we use a unique, biodegradable, 100% safe cleaning system that has been developed over a number of years. 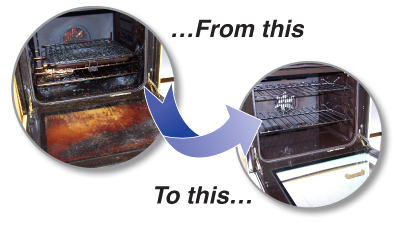 Unlike other oven cleaning processes we do not use any caustic or dangerous chemicals. Our chemicals are low pH with no fumes or unpleasant odours. Firstly, leicester oven cleaners will strip down the appliance by removing the shelves, interior 'self-cleaning' panels and fan guard. These parts then go in to a custom-made, van-based heated system where the grease and burnt-on food deposits are 'erased'. Our technician returns to the oven where our specially-developed, caustic-free formula is applied to the interior of the oven. Using our cleaning tools and some hard work, the grease and burnt-on carbon is removed and the interior of the oven is then completely de-greased and polished along with the bits that you can't normally get to (e.g. around the fan, between the door glass etc.) The remaining parts in the system are then rinsed off and the oven is re-assembled. 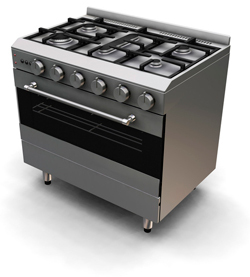 Using our de-greasing solution, the exterior of the oven and hob is cleaned, polished and left shining. Now your once filthy but vital appliance is gleaming and really does 'look like new' inside and out. The same kind of attention can also be given to your hob, extractor-hood (including free primary filter) range, aga and microwave. Don't spend your time worrying about how to clean your oven – discard your domestic oven cleaners and leave oven cleaners in leicester to do the hard work.